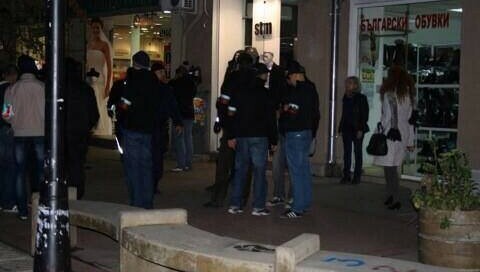 In the Bulgarian capital, Sofia, groups of fascists in paramilitary uniforms are conducting what they describe as ‘civil patrols’. The purpose of the patrols is to stop people in the street and then demand to see their identification or immigration documentation. Leading member of the far-right National Union Party, Boyan Rasate has claimed that the city council and police force are well aware of the patrols and do not object to them. Boyan Rasate and his party have been toking up racial tensions over the last twelve months, holding rallies and marches, demanding that all refugees be deported, and calling for a ban on the sale of land to non-Bulgarians. There are over 9,000 refugees currently living in Bulgaria, with at least 70% originating from Syria. Many live in cramped and unsanitary conditions with little food or money. Violent attacks on refugees are increasing at an alarming rate. In the last week, a Roma family out walking were attacked by a group of neo-Nazis, a Nigerian immigrant was attacked on a bus, and a shop worker was stabbed by a group of boneheads carrying a banner that read – “Death to refugees”. Racism is being fuelled by the national media who have published a series of inflammatory, and by a Sofia MP who describes immigrants as “Cannibals” and “Islamic Fundamentalists”, and accused them of bringing crime and disease to Bulgaria. Fascists are not just targeting immigrants - over the last year the various Bulgarian fascist groups have attacked ‘pride’ marches, and have attempted to attack and evict protesters from the recent university occupation in Sofia. Several of these groups have very recently amalgamated to form an overtly fascist party. Earlier today several hundred antifascists marched through the Bulgarian capital to a protest rally to highlight the rise of xenophobia and of the growing fascist movement in Bulgaria. Great to see this post appearing in alarming times for Bulgaria and fascism in Europe! I will just make a few additions and comments, without really being inside the country at the moment, hence not up-to-date with everything. I think the post underlines mainly Boyan Rasate's party. His party and patrols are scary, primerally, because of their existence! However, to my knowledge the Rasate circle is not as active as it used to be a couple of years ago. It comprises mainly of 'old-fashioned', militant however, patriots, some of which are boneheads, others are those who go to re-enactments of the liberation of Bulgaria from the Ottomans. 1. Ataka (eng. for Attack) - the populist party with most power and the one currently inside the parliament. Just before their entering into the seats of parliament, the party was very influential within, both, the far-right boneheads and the 'so-called' nationalist/patriots. They used scenarios of media corruption, foreign corporations digging up gold in Bulgaria, buying of land by foreigners (Turkish especially), threatenings, etc. etc. Quite populist as one can imagine! However, they lost support (and were mocked in one famous incident where they were occupied and thrown food at by protesting masses in front of their office) since their entrance in the new government (being able to be established thanks to the single vote of the leader of the party) Link on the emergency votes earlier this year. After spitting a lot before the votes themselves and actually 'securing' the new government after, many felt that as a betrayal, hence why this party is currently taking a lot of criticism even from people on the far-right! - This year, with the wave of Syrina and other immigrants, they have caught the media eye with threats about the numbers of immigrants, evil-plans about EU wanting to flood Bulgaria with immigrants, etc. This culminated, and what I think was the spark for far-rights, in the multiple stabbing of a Bulgarian shop worker (member of the junior section of the party). The girl was stabbed by an illegal Algerian who was robbing the shop. Later he was caught in Greece. After this event until this moment, there have been (as the article suggests) multiple cases of beaten, stabbed innocent! immigrants, people of different descent, gypsies, or just people with darker skin . The party itself came with a statement/ultimatum! to the government to 'clean all immigrants' Link here. They are appearing very 'sympathetic' to all those boneheads, football hooligans and simply people pissed off with the government and the immigrants in particular! Although, small group at the moment - with the events sparked by VMRO and all the accidents, one never knows how big they actually are! To my knowledge, the Blood and Honor in the capital Sofia were disbanded for a while (members of far-right in CSKA and Levski football-club). In my hometown (Plovdiv), Blood and Honor were small and very rarely active, but existing! Not sure for other places in Bulgaria. 4. Rasate and other supporters - media etc. Yes, Rasate is also pushing for 'cleaning of immigrants' and he is the one with the patrols! He had media attention for nearly a decade and is well-known within the country, for being a 'patriot'. Another player currently is the media, which has been literally drowning the people with information about immigration, violence, etc. (nothing new!). 1. On the one hand stands the 'Golden Dawn' model - crisis, unstable government, big class separation (small middle class and workers' force), sudden flooding of immigrants, conspiracy scenarios, etc. Further to this, with the current situation and the level of patriotism in Bulgaria, any, even slightly, more intelligent idea that connects immigration to the real problems the country is facing, sparks a huge debate inside people with or without political affiliations! I think, in that sense, Bulgaria is having a similar model of far-right ideological propaganda as in Greece! And we know this had a lasting effect until this very moment! 2. On the other - there is a large generational gap (as any other ex-Socialist country) which has led the youth to be chaotic, sporadic and very negative on the situation in the country. A lot of the youth that is in Bulgaria is disaffected with the ideas their parents/peers have, thinks of them as old-fashioned or 'unpatriotic' etc. Violence, as anywhere poverty reigns, is present heavily in media, but also on the streets! Ideas of 'being strong', 'hating tolerasts' (as people who try to reason with them are called), 'football hooliganism', etc etc. are and have been spread in the decade after the end of Socialist dictatorship! Further to this, Bulgarian society is very much unprepared to resist! We have had active protests for the first time since the end of Socialist dictatorship this year! Further, many Bulgarians are seeing people of African or Middle East descent walking on their streets more often - for them that is very new and, as anything new, strange and alienating!